Part of my practice is learning to listen when Divinity whispers in my ear or sends me a sign, coaxing me to act. An email from my friend Aarti landed in my inbox. She wrote about donating the proceeds from her London practice to a charity in Nepal called House With A Heart. Confused, I asked her what she was doing in London and inquired about her sons. Aarti wrote me back reminding me that she was a British chiropractor who had visited Bahrain and gave me a treatment many years ago. Silly me. I confused my American friend with this woman. Funny coincidence – or was it a Divine sign? Nepal is the birthplace of Buddha, the man previously known as Prince Gautama. When Gautama left his palace, he discovered the world was filled with suffering. He encountered a diseased man, a decaying corpse and an ascetic man. This depressed him, and he renounced his princely life to learn to overcome aging, sickness and death by living the life of an ascetic. 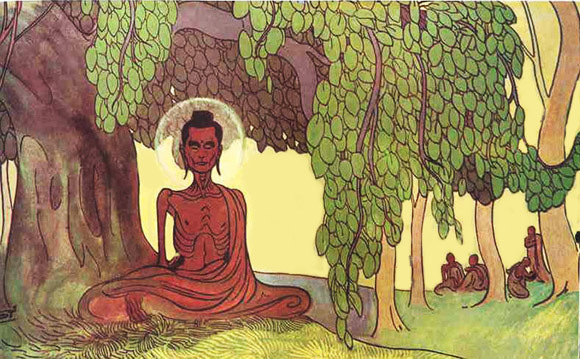 He practiced extreme self-mortification and, weakened by starvation, ended up sitting under a banyan tree in a nearby village called Senani. The golden bowl floated upstream, all the while keeping to the middle of the river, a sign. Although that sign has helped millions adhere to the compassionate, Middle Path of Buddhism, it has not done much for the women and children in Himalayas in the country of Nepal. Today, Nepalese people continue to live in extremes. 24.5% of the population lives on $1.25/day and 57% live on $2/day. Without any government safety nets or affordable education, fathers leave families, mothers work at low paying carpet jobs, and children are abandoned or indentured as young as five. Ghar Sita Mutu started in 2001 when Beverly Bronson picked up two orphans, 2-year old Babu and 5-year old Krishna off a Kathmandu street. Twelve years later, Krishna is going to off to school in America, and Ghar Sita Mutu is home for twenty children. Beverly literally turns away children because they do not have space for more. Trains women in sewing, candle making, felt making and knitting with the goal of making them self-sufficient. $10 buys 30 skeins of wool or pays a teacher for one month. $15 feeds a child for one month. $384 will provide basic living expenses for a child for one year. Unfortunately, when Gautama went into the world, he did not meet an abandoned child, a starving mother or a homeless grandmother. Perhaps the fate of women and children would have been different if he had. You can read all about Ghar Sita Mutu, see photos, listen to Beverly speak or donate by clicking the links.